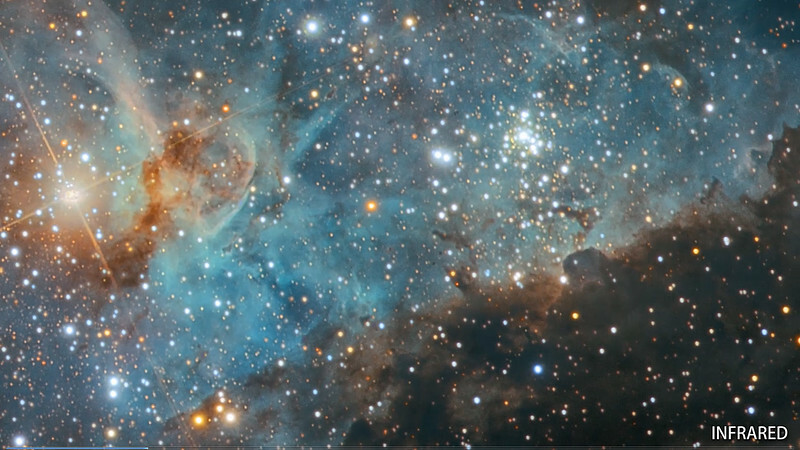 This video is a tour of the Great Nebula in Carina (NGC 3372) in both optical and infrared light. The music was composed specifically for this animation by my longtime friend Thomas Regin. This majestic nebula is one of the largest nebulae in the sky and lies about 7,500 light years distant in the Southern constellation of Carina, The Keel. Several star clusters containing some of the brightest and most massive stars known are found here, including the extremely luminous hypergiant star Eta Carinae - one of the prime candidates for the next supernova explosion in our galaxy. Traditional images of the Carina Nebula taken in visible light primarily display the striking magenta colour from glowing Hydrogen gas, as well as large dark obscuring clouds of dust. But infrared light penetrates these clouds better and allows for a deep peek into the heart of the nebula, revealing complex details and thousands of young stars that are otherwise completely invisible. These stars shine primarily in the infrared and appear as golden red in this image. Only a minority of these are even visible in traditional images.